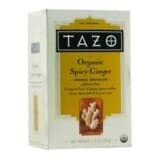 I am working my way through the Tazo Teas. I thought I would document my experience with each and every one of them. I use a metal kettle on a gas stove to heat up the water. I used to microwave every cup but using a kettle heats up the water hotter and more evenly. Also, using the microwave makes for a drippy mess. Anyway, I found this tea to be perhaps the best tea I’ve ever tasted! It’s that good! You can really taste the ginger. The overall flavor is very good. It has a nice smell as well. I will post more in the future about other teas I’ve tried, including Sleepy Time. This entry was posted in Tazo, Tea on December 28, 2011 by Christopher.